On November 8, China shocked markets with its latest targeted stimulus in the form of an "unprecedented" lending directive ordering large banks to issue loans to private companies to at least one-third of new corporate lending, said Guo Shuqing, chairman of the China Banking and Insurance Regulatory Commission. The announcement sparked a new round of investor concerns about what is being unsaid about China's opaque, private enterprises, raising prospects of a fresh spike in bad assets. 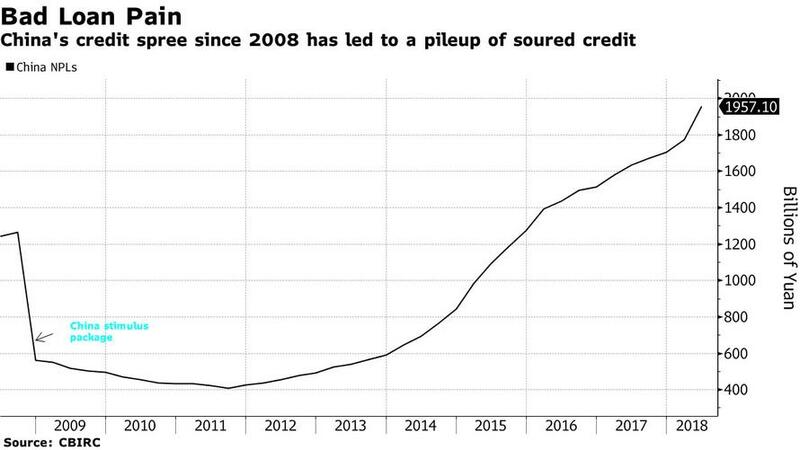 More importantly, this is the first time China set formal goals for private lending, a step it refrained from even during the financial crisis of 2008 according to Bloomberg. The stimulus package it implemented at the time swelled bad debt levels, which now threaten to swallow any new money poured into private companies. 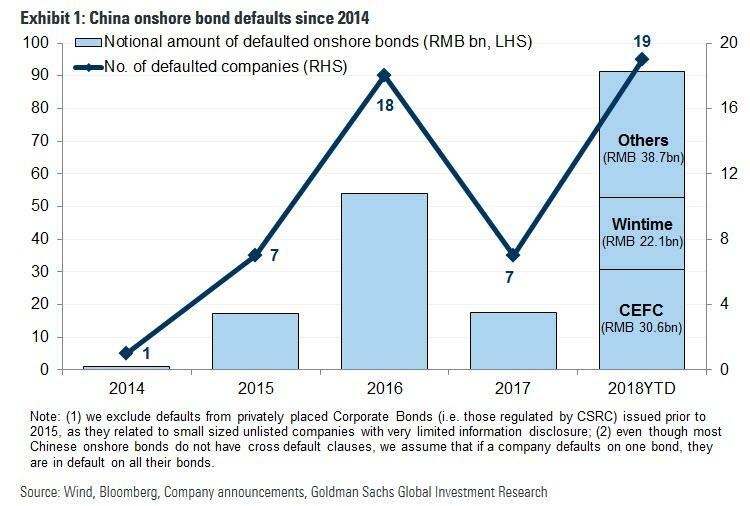 Non-state firms defaulted on 67.4 billion yuan ($9.7 billion) of local bonds this year, 4.2 times that of 2017, while the overall Chinese market is headed for a year of record defaults in 2018. According to commentators, the new policy was prompted by the need to ensure that China’s private firms, already challenged by China's state-owned behemoths, survive amid a plunging stock market, record corporate defaults and a cooling economy. At the same time, the target for small and medium-sized banks is higher, at two-thirds of new corporate loans, with Guo adding that he wants to see loans to private companies account for at least half of total new corporate loans in three years. But most importantly, this targeted lending will increase market concern on banks’ "civic duty" with Huatai Securities predicting a new sharp spike in NPL ratio amid the accelerating economic slowdown, which would prove negative for short-term sentiment. Firstly, PBOC is looking into the possibility of promoting equity financing for private firms. The central bank is working with various financial institutions such as fund managers and brokerages on this initiative. Secondly, PBOC will expand a recently launched scheme to promote private firms’ bond issuance in collaboration with financial regulators. Three companies have already raised 1.9 billion yuan of bonds with over-subscription, and 30 more private enterprises are preparing for bond issuance. Thirdly, PBOC will add a new metric in the MPA formula to encourage lending to private companies. They will also increase the supply of long term and reasonably priced funding for financial institutions (further RRR cuts would fit this goal, in our view). As Goldman notes, "it is rare for a senior official to openly acknowledge previous policy missteps." As a result, this is likely in response to the recent meetings hosted by President Xi, especially the one with entrepreneurs. That meeting was unique in that it carried the highest political authority and at the same time was very specific in terms of the measures to be taken. As such, it likely put the onus on senior officials who attended the meeting to act in a timely manner. While the governor stated there is no change in the overall monetary policy stance, which is described as prudent, and more support for the real economy via more bond issuance had been stated previously, his comment on past policy missteps suggests a change in policy stance. Rather, the reiteration of the current policy stance should be read more as an indication that the PBOC will be measured in terms of the size of additional loosening. In terms of more tangible measures, Goldman now sees a higher probability that TSF growth will accelerate from now, but likely at a very measured pace. Worse, many of these new funds will end up funding underperforming assets, resulting in a spike in on-performing loans and more bad debt. ... while the Shenzhen Financial index sliding 2.2%, following another drop the previous day.